On 6th October 1536 William Tyndale was executed in what is now Belgium but at the time was part of the Spanish Netherlands. William Tyndale is renowned for being an early translator of the Bible into English, and for making a substantial contribution to the richness of the English language. As a clergyman, Tyndale was bound to obey the dictates of the Roman Catholic Church, but found himself at odds with the Church over the matter of the Bible not being available in English. The people were required to attend Mass, but this was always said in Latin (which was true well into the 20th century) and readings from the Bible were also in Latin, in the translation known as the “Vulgate”. Tyndale once had an angry exchange with a traditionalist in which the former swore that he would “cause the boy that drives the plough to know more of the Scriptures than you do”. Being a gifted linguist, Tyndale made it his life’s work to translate the Bible into English. The atmosphere in England was so antagonistic to his thinking that Tyndale left for the Continent in 1524, settling first at Wittenberg (probably – there is some doubt about his actual location at this time) where he began work on translating the New Testament from Greek into English. Tyndale was a fast worker, and the task was completed a year later although it was not until 1526 that copies were printed and started to be smuggled into England and Scotland. Within a decade 50,000 copies were in circulation in the British Isles. Tyndale’s unpopularity with the religious and political establishment in Britain was compounded in 1530 when he published a pamphlet that condemned King Henry VIII’s divorce from Queen Catherine of Aragon. He therefore made some very powerful enemies, namely the Catholic Church and the King of England. Undaunted, William Tyndale started work on translating the Old Testament from Hebrew into English. Being in Germany was essential for this task, because speakers of Hebrew were non-existent in England due to the 14th century expulsion of the Jews under King Edward III. Many of these had fled to Germany, where their descendants still lived and were able to teach the language to Tyndale. With King Henry’s chief minister, Thomas Wolsey, making steps to have Tyndale arrested in Germany, he fled to Antwerp which was even more dangerous in that, being in the Spanish Netherlands, it was subject to the activities of the Spanish Inquisition. 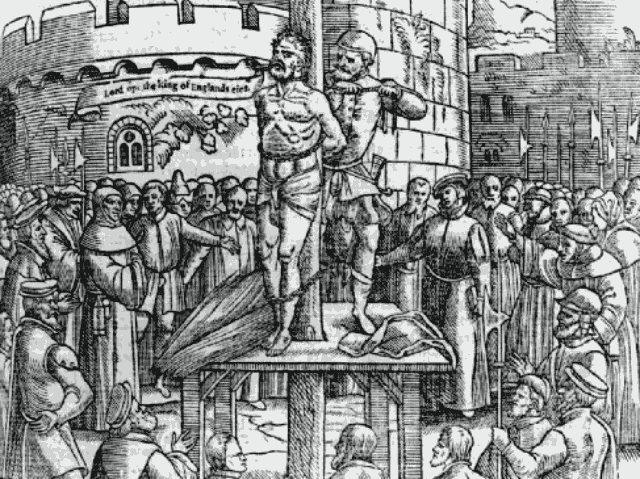 Tyndale was betrayed and accused of being a heretic, for which the punishment was execution by burning at the stake. 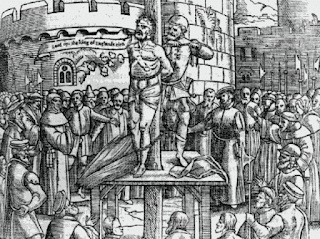 The execution duly took place on 6th October 1536, with Tyndale first being strangled then burned. His last words were reputed to have been: “Lord, open thou the King of England’s eyes”. This prayer was granted only four years later, when King Henry, who had by now declared himself to be the head of the Church of England, authorised the “Great Bible” to be read in church. This was largely based on Tyndale’s work, with the Old Testament completed by Miles Coverdale.